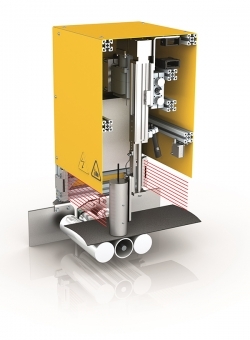 The ChimCheck system from KraussMaffei Berstorff allows the conductivity of chimney strips to be checked immediately after the extrusion process through touchless measurement. Off-spec batches can thus be detected during the production process to minimise scrap. Since the system can detect issues earlier, fewer completed tires need to be scrapped, which results in large cost savings. ChimCheck 500 checks the chimney conductivity in-line at variable production speeds. The system is designed for automatic and non-contact measurement of the electric conductivity between the outside and inside of the tread. The motor-driven electrode charges the strip that is placed on an earthed conveying system. The fully functional chimney strip eliminates the electrostatic charge via an additional earthed electrode. If the electric resistance is below the pre-set value, a message will appear. Thanks to the non-contact monitoring principle, there are no restrictions on the choice of marking system. As standard, the machine is delivered with a sturdy base frame designed to accommodate the temperature control units and the lubrication system. The control software can be seamlessly integrated into the digital factory; the onboard operating panel, which displays all the important extruder information, is easy to use and saves time.